Enjoy fresh fish grilled on a cedar plank. Quick and easy to make. Rub pre-soaked plank with olive oil. 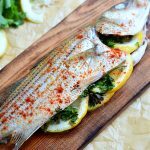 Place whole fish on plank. Season inside of the fish with sea salt, pepper, paprika and garlic powder. Stuff inside of fish with lemon slices and parsley. Grill 10-14 minutes on a covered grill for optimum smoke. *The key is to make sure the grill is good and hot!